Enjoy your trip with Hotel Mare, optimized for business travelers! Following the Hotel Mare in Gangnam, Hotel Mare opened besides Janghanpyeong used car parts market as a hotel optimized for business travelers. Room design is modern and simple with white color as its base. Guests can enjoy a comfortable stay with a wider screen TV and latest PC equipped in a room. In the bathroom, shower and toilet are separately equipped. The outer appearance of the hotel gives a luxurious impression like a little palace. 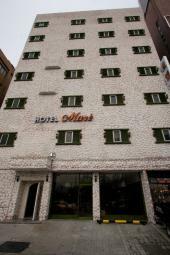 The hotel is located between Dapsimni station and Janghanpyeong station of subway line 5. The access to other areas by subway is very convenient. Enjoy your stay in Seoul with a special comfort at Hotel Mare.